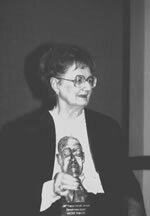 It was with great sadness that the SF community learned of the passing of Andre Norton this week. 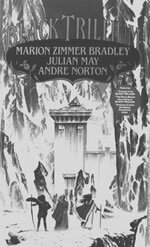 Tangent published "Days of Wonder - A Conversation with Andre Norton" in 1996, and we bring it back now as the first of our TO Classics. 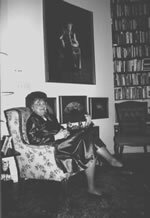 Andre Norton at home in Winter Park, FL, Christmas 1993. Andre is seated beneath a portrait of her painted by reknowned artist Barbara Tiffany-Eginton. Alice Mary Norton was born February 17, 1912, in Cleveland Ohio. She had her name legally changed to Andre Norton in 1934. Generations of readers were first introduced to contemporary Science Fiction and Fantasy with her stories. Andre is a woman who has remained modest and genteel throughout seven decades of publishing, and she continues today as one of the world's most widely popular authors. During a visit to her home in Winter Park, Florida this past summer, Andre discussed the influences which led her to become a writer. She also spoke about family and friends, other projects, and what it takes to be successful in the field today. "My family history in America begins in 1634. 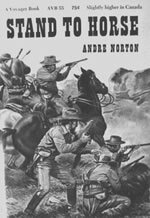 Although we are the last of the Eastern branch of the Norton family line, I heard several years ago from a family member in one of the Western branches. She told me that my uncle, who was a great deal older than my father, had five daughters, and the last one of these had just celebrated her one hundredth birthday. It is unfortunate that mother's history was never documented. We know that there had been an Indian marriage way back. Mother's mother had three brothers who had served in the Civil War, and her fiance was killed in the Battle of Gettysburg. "Mother started reading to me when I was two years old. By the time I was four, she was reading Little Women, and I could follow. When I started to read by myself, it was Uncle Wiggley, the Old Mother West Wind stories, and all of the Oz books. My family was book-minded, and there were always books in the house. My grandmother on my father's side was considered an oddity because she read a lot. We made it a point as a family to go once a week to the public library. As a teen-ager, I enjoyed Verne and Wells but I also read over a rather wide field. 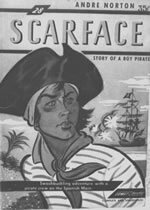 I enjoyed reading adventure stories such as those written by Talbot Mundy and Harold Lamb. I remember The Little Princess and The Secret Garden, books that are still worth reading today. "To me, the sense of wonder means that a book becomes so alive to someone that they remember it for a long time afterwards. I remember experiencing it when I first read The Face In The Abyss by A. Merritt. I would buy Thrilling Wonder Stories, Planet Stories, Amazing Stories, Astounding Stories, and others. This was in the days when one had to hide these types of magazines, because they were considered by some to be so trashy that a person would not want to be seen in public with them. 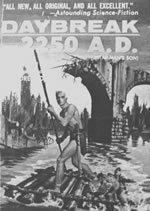 Some of my favorite writers of that era were Eric Frank Russell, Edmond Hamilton, Leigh Brackett, C. L. Moore, and others. "The biggest book shop in Cleveland also had a sales table, where they placed books that hadn't sold during the Christmas season. One book which I recognized right away was The Outsider and Others by H. P. Lovecraft, the first Arkham House book. It was priced at $1.50. I bought it, and still have it today. "I started writing in high school, when I was on the staff of the school paper. As the editor of the literary page, I had to write short stories. And, in study hall I began to write my first book, which eventually was the second book that I had published (Raleston Luck, 1938). During those early days, agents were really unknown. So, when I was ready to submit my first novel, I got an alphabetized list of publishers and sent it to the first name on the list, and they accepted it. 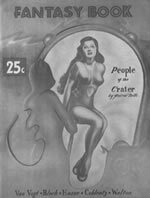 My first Science Fiction story was 'People of the Crater', which appeared in the first issue of Fantasy Book in 1947. "I was children's librarian at the Cleveland Public Library for over twenty years, from 1930-1951. Each month the librarians would receive a book to review. If there was some objection to the book, and we still wanted it, we would have an opportunity to defend it. I remember getting The Hobbit and nobody had heard of Tolkien, so I had to argue for it like mad. Another book that they absolutely refused to put in because of the title was John W. Campbell's The Moon is Hell. During my twenty-two years at the library I worked in all but two of the forty-seven branches. There were many ethnic enclaves in the city, including Italian, Czechoslovakian, Russian, Polish, Ukranian, Jewish, and Chinese. Just before the war I had an opportunity as special librarian on a citizenship project in Washington D.C. I was to select books on what it was like to be an American. This was for people who were learning the English language, so books had to be rewritten and simplified with a limited vocabulary. "In the 1950's I worked for Gnome Press, reading manuscripts for Martin Greenberg for about three years. This was a time when I was otherwise unable to work, due to continuing attacks of vertigo. Marty would send manuscripts to me, and I would read them in bed. One of them was The Forgotten Planet by Murray Leinster. Greenberg did not send them regularly, since he didn't have a lot of money. He said that he wanted to bring out books that could be sold as a series to high schools, so I began writing The Solar Queen. He didn't want me to write as Andre Norton, since I was working for Gnome Press. He asked me to pick out another name, and Andrew North sounded close, so I chose it. "Getting published depends a great deal on luck. It involves getting the right type of book to the right editor at the right time. I lost out on sales twice because they had already bought a book on the same subject. It also depends on networking. When one hears that a company is interested in certain kind of books, you can try your book out there, since since you know that the editor would read it. If you offered it to an editor who was not in favor of that type of book, no matter how well it was written, it wouldn't go. They don't bring out books just because they are well written, it's all about how much money they can make. "It used to be that writers would take a smaller advance, and then they would get royalties for years. After the law passed about publishers having to pay taxes on what books were in warehouses, they began to remainder them more quickly. In the older days, I had books that remained in print for twenty-five years, and they continued to sell, but today the publishers don't keep copies of my books. When people or libraries ask for certain titles, they are told the books are out of print. The typical life of a hardcover book is only a few weeks, unless it is a blockbuster, and new paperbacks only remain on a bookshop's shelf for a month before they are pulled. They need room for the new books coming out all the time. "I was told that publishers aren't interested in taking books in the adult field under one hundred thousand words. Some of my earlier books were shorter, about sixty-five thousand words. It was a regulated way of writing, each book consisting of about eighteen chapters, ten pages to a chapter. When I was starting out, the quality of writing had to come up to a certain standard. Today, some books that are really well written are being turned down, while others that are trashy are getting published. "Basil Wells had a farm in Pennsylvania, and one summer he had an all day party. Among the guests were the Wollheims, P. Schuyler Miller, and me. It was here that I met Don and talked him into reading Witch World. Many years later, when Don told me he was leaving Ace Books, I had a book ready for him (Lore of the Witch World). I said that he could take it with him and that I'd go too, since I wasn't under a contract. He was a nice person to work for.."
"When working with Robert Bloch on The Jekyll Legacy, we agreed to produce alternating chapters, I writing from the woman's point of view, and he writing from the man's. During this time, we ran into some peculiar situations. Robert had the hero invite the heroine to the premier performance of the Pirates of Penzance. I told him that he mustn't do that, since no unmarried lady of virtue would go without a chaperone. So, we introduced a family for the hero, with a sister who would accompany them. When I was writing Velvet Shadows, I had to do a great deal of reading on how a woman of good standing travelled. This was set in the 1870's. When a lady went to a major hotel in a big city, she would never set foot in the lobby. She would enter a separate parlor and tell the maid that she wanted to register.."
"When Arthur C. Clarke was in Orlando, Florida in 1994, we went to visit him. He greeted us in his traditional sarong, and invited us in for tea. He is an amusing person, with the wonderfully dry wit of the English. We talked for a while, and he told us about his new television series (The Mysterious World), his thoughts on the effects of the comet crashing into Jupiter, and the future of mankind's space program. Overall, we had very pleasent time, but I felt rather overawed by him, due to his standing in the field." "Production will begin later this year on a movie to be based on two of my books, Wraiths of Time and Shadow Hawk. It will be made by Studio City in cooperation with Disney, and filmed in Florida on an $8 million budget. This will be the first movie that we know of in which blacks are neither slaves nor street people. They are seen at the height of their civilization in Kush. The Kushites invaded Egypt and founded a dynasty, which they held through two reigns. When I wrote Shadow Hawk, there was not much known about Kush. It is a very dry place, difficult for archeologists. Recently, they restored one of the royal tombs, a small pyramid. They also found out that the city was one of three trading posts along the Nile River, which curled around through the Sahara Desert. Eventually, the Greeks put ships in the Red Sea and they were able to defeat the Kushites. 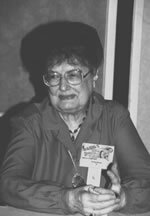 Andre Norton in May 1994 at Oasis 7 Con in Orlando, FL. "There's no writer that doesn't make mistakes, or no writer who can say that they've reached the top, because you never do. No writer is ever entirely pleased with a finished product. It isn't the exact same thing that was in their mind. "The advantage in the older days was that my first editors knew the field well, and they cultivated a relationship with their writers. This is unlike today, where half of the time an author doesn't know their editor. The whole trouble with the writing industry today lies in the buying and selling of companies, such that you don't know who you are dealing with. Many editors are now MBAs, instead of literary people, and they are mostly interested in how well a book will sell. They won't take a chance on a new writer. There is real competition today for shelf space, advances and book promotions. "It is absolutely necessary for aspiring writers to prepare themselves for a job, because it may be five or ten years before you can make advances big enough to live on. Also, they should attend an adult writing course, so that they can identify weak spots. Most publishers will not read a manuscript if it has not been submitted by an agent, and most agents won't represent writers until they have been published. "A lot of children's stories these days, while being well- written, are downbeat. They have no hope, and the protagonist is someone that you wouldn't like, and they are no better off at the end of the story than they were at the beginning. This is a new format, and it's getting in to stories in the Science Fiction and Fantasy fields. Also, television has deadened the sensitivity of people toward violence, and they don't read as much, or use their imagination; they just watch what's on the screen. "There are a lot of good writers coming along, if they could just get a chance. When I read the L. Ron Hubbard's Writers of the Future stories, I'm always amazed at the quality of the stories. The difficulty is in getting published. There is room today for young writers in the field, but it depends a great deal on luck. You have to hit the right editor with the right type of book at the right time. A good way to start these days, if you want to sell, is to write in the Young Adult field. It's not as crowded. I also think that the small press today provides a chance for writers to get started. "No one should do a book unless they do their best. An author should not write down to their audience. Some friends of mine have been given charts of what elements are to go into a book. This disgusts them, but they feel that they must do it if they want to sell the book. It is up to an author to deliver the best that they can. I have never tried to scamp on a book. I always try to do my best. Andre Norton and The Howard at the World Fantasy Con, Nashville, TN, October 1987. Andre Norton has received many major awards, including Hugo Award nominations for Star Hunter (1962), Witch World (1964), and Wizard's World (1968); The Phoenix Award (1976), for overall achievement in Science Fiction; The Gandalf Master of Fantasy Lifetime Achievement Award, (1977); The Balrog Fantasy Award (1979); The E. E. Smith Award (1983); The Fritz Leiber Award (1983); The Nebula Grand Master Award, Science Fiction Writers of America (1984), for Lifetime Achievement; The Jules Verne Award (1984); The Second Stage Lensman Award, for Lifetime Achievement (1987); The Howard, World Fantasy Convention Award (1987); and, The First Fandom Hall of Fame Award (1994).